Paul Lee, left, and Jimmy Meeks set up for the Sheepdog seminar Friday, January 29, 2016 at Brainerd Hills Baptist Church. › Create a security task force from volunteers in the congregation; they can figure out evacuation routes and keep the congregation aware of what to do if there ever is a violent attack. › If task force members plan to wear their weapons in church, require them to get firearms safety training if they do not have a law enforcement or military background. › Church members stocking a food pantry, bundling care packages or any other task that requires them to use just one room in the church should keep the rest of the church doors and windows locked. And they should lock the door of their own room after them and never answer a knock on the door without asking the visitor to identify himself first. › Chuck Chadwick, president of Gatekeepers Security Services and founder of the National Organization of Church Security and Safety Management, advocates that task force volunteers take a seminar or classes in de-escalation techniques that police use when dealing with people who are irrational due to mental illness or substance abuse. › Chadwick also advises churches to have two-way radios available on each floor or in different rooms of the church for congregants to use in an emergency. If a violent intruder has made it unsafe to move within the church, the radio will be easy and fast for contacting help, and whoever uses it won’t have to find anyone’s cellphone number. › New South River Baptist Association has a detailed national safety guide for churches that advises pastors to install a panic button in their offices. Without dialing 911, they can hit the button to alert police if they are in danger. › The Baptist guide also advises congregants to slide their car keys into their pocket during worship service. If there is an emergency evacuation, getting into the parking lot is not enough. Getting into their cars and getting far away from gunfire is the goal. › Churches should not keep large amounts of cash on the grounds, the Baptist guide also advises. Any money from the offering plate should be deposited in a bank dropbox on the same Sunday. Different deacons or church elders should make the deposit, not the same person each time. › Make sure adults caring for children in the church daycare know the names of the children and have photos of the custodial parent for each child. › Do not let children or even teenagers go door-to-door raising money for church programs. Always have an adult accompany them. Worshippers in First Baptist Church of tiny Daingerfield, Texas, were singing "More About Jesus" when a 45-year-old man wielding a AR-15 rifle burst through the door. Usher Gene Gandy turned to greet the visitor — and was shot multiple times, killing him. "This is war," the gunman screamed. Police reports say that, within 10 seconds, the gunman slaughtered five churchgoers and wounded 10. One man knocked the rifle out of the intruder's hand, but the shooter simply pulled a .22-caliber pistol from his vest and shot the man. Two others bearhugged the gunman so they could shove him out the door while he kept firing bullets into their torsos. The pair died on the church lawn; a monument honoring their bravery now stands on the church lawn. The June 22, 1980 massacre may have been the first in the pre-Internet era to make Americans aware of the phenomenon of mass shootings in churches, partly because a documentary, "Faith Under Fire," examined the tragedy. The shooting became a personal landmark for Texas police officer and ordained Baptist minister Jimmy Meeks, who married his wife Julie in the church. 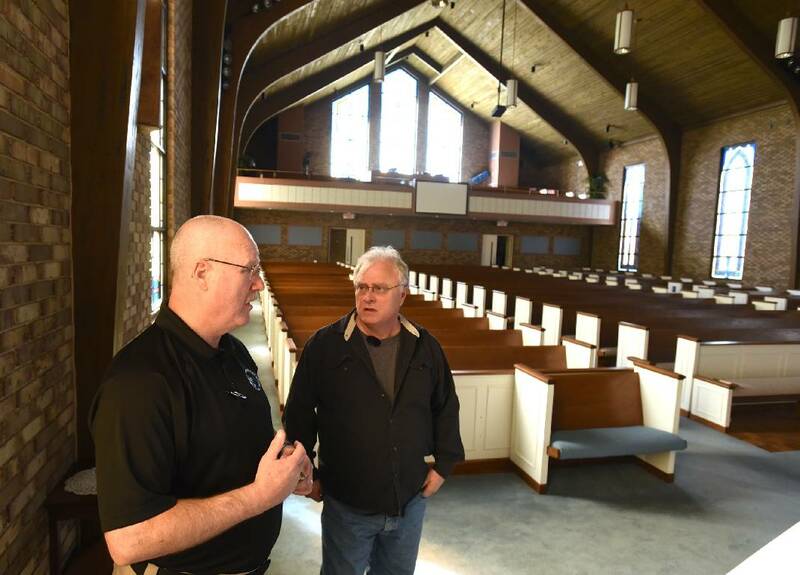 Now retired after 35 years as a cop and 42 years as a pastor, Meeks travels America, hosting seminars that teach churches how they can protect themselves from violence of all kinds. Calling them Sheepdog Seminars after the shrewd and nimble dog who cares for flocks, Meeks tracks grim news stories that range from rapes in church bathrooms, the stabbing of church pantry volunteers to mass shootings. He studies the incidents to figure out ways in which the killings or assaults might have been prevented. "It breaks my heart when I hear a church folks say they trust God to protect them because God gave us minds and skills that will help us protect ourselves in a lot of situations, and he expects us to use those gifts to keep churches safe and able to do their good work," Meeks says as he's busy setting up for a Saturday Sheepdog seminar at Brainerd Hills Baptist Church, an event that he says "about 400 had signed up to attend." Lt. Col. Dave Grossman is a director of Sheepdog Seminars Group International. His online bio says he is a former "West Point psychology professor, professor of military science, and an Army Ranger who has combined his experiences to become the founder of a new field of scientific endeavor, which has been termed killology." The other regular speaker at Sheepdog Seminars is Carl Chinn, who was one of four hostages when a man entered the Colorado Springs Focus on the Family center in 1996 and threatened to blow it up. Afterwards, Chinn began focusing on church security and helped develop the security program at New Life Church, also in Colorado Springs.
' Examine how their buildings are laid out.
' Note exits that lead directly to parking lots and streets.
' Determine which classrooms and bathrooms can be locked from the inside.
' See how many doors give access to the sanctuary where everyone gathers for worship.
' Find where blind spots in stairwells are located.
' Learn which windows can be opened wide enough for an adult to slip through. Police Lt. Andrew Mills from San Diego, Calif., helped write a chapter for a national church safety guide suggesting that church pastors collect all this information and also take a photo of every room in the church. If a shooter invades the church, the schematics and photos can be given to police so they can figure out how to rescue hostages and evacuate the congregation. "The beautiful old tradition of leaving a sanctuary open all night so the broken-hearted or searching can come in and pray — those days are over," Meeks says. "Lock the sanctuary at night. If you have a janitor cleaning the church at night, make sure he locks all the doors so he'll be safe. "People do not need a sanctuary to pray and get comfort from God. They can pray at home, in the car, in a park. The Bible says go into your closet and pray. People don't have to show up in a special room to talk to God. And no one at church needs to be put in danger for someone to find comfort in prayer." Meeks says he's happy to see churches feeding the homeless and collecting blankets and coats for the needy, but he would also like to see churches hire an off-duty police officer, if they can afford one, for events when large numbers of strangers are certain to show up. If that is not financially feasible, he would like the church to keep its people safe by having some members trained to spot potentially unstable visitors, to alert local police about the event and have a crowd-control procedure in place so there aren't too many people for the volunteers to keep an eye on.